Do you watch Biggest Loser? I love this reality tv show. I thought it is very inspiring and amazing show. It helps people to change their lives and have another chance of living a healthy life. The challenges that the contestants go through are tough and it's amazing how they lost weight every week. The trainers really did an excellent job in training the contestants. I so admired Jillian Michaels, the lady trainer, for being so tough. She is very strong and really pushed her trainees to do their best. I know she has her own fitness DVD and I am pretty sure it's a good exercise; a super extreme workout. It would be great to have it and follow. Back in my country Philippines, I heard that they will also launch a franchise of the show. From the last report I saw on The Filipino Channel they are already doing the audition. I am excited who will be their trainer and if they can par with Jillian Michaels. I am contemplating on using contraceptive pill but the thought of its possible effect is scaring me. My friends here who are taking the pills complained of breakouts and irregular menstruation. One friend is now having a problem of acne breaking out. She got scars all over her face that she is considering of acne scar removal. She tried the scar removal cream you can get at the local drugstore but it didn't work for her. So now I am worried of the acne breakouts once I started to take the pills. But I really need to start taking it this early. I am not ready for another baby yet. Our DD2 is still tiny and I don't have somebody to help me out aside from my husband. Tomorrow I will be going to the hospital's pharmacy to pick up my prescription. I am praying I will be spared of the acne effect. Do you smoke? I don't and nobody in our household does. But I remember while growing up my grandfather love to smoke cigar. I used to buy his cigar for him from the across us. When my brother comes home from his overseas job he'll bring cigar to him as well. I wish my grandfather is still with us. How I would love to let him try different cigars that I am pretty sure he would love like the Swisher Sweets I saw online. One day I asked my grandpa why he like the cigar than the regular cigarettes. He answered that he just like the taste of it. Until now I can still picture him having his cigar in my Mom's garden. Wow, I think I just miss him that's why this nostalgia. I also asked my father if he wanted to smoke cigar but he told me he don't want to start it he may be hooked on it later. He stopped smoking when I was in elementary and I am very glad he did because he has ailments that I know will only complicate when he continues it. This is what I love about summer, the dipping in the water with friends. The kids loves every time we are in the pool. Our DD1 will wear her swimsuit as soon as she got off from the bed. She will then tell me go to pool Mommy. Right now I can't fulfill her wishes often because I can't watch her while she's in the water. 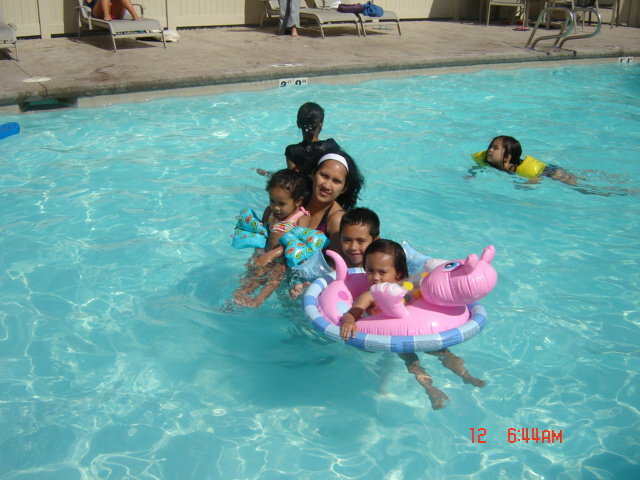 I need to have somebody to watch the little one so I can be with her in the water as well. This picture was taken this past Sunday at our apartment complex's swimming pool. It was sunny but a little bit windy. The water is kinda cold but after few minutes it'll be comfortable. I am hoping when hubby gets here we will still be blessed with nice weather so we can go swimming again. This is the second summer that I can feel the heat up to my bones. Honestly, I dreaded to go out because I feel my energy depletes easily. My skin in my forehead got sun burnt after being out watching the kids waddled in the pool. The heat of the sun can really increase wrinkles in our skin and too much exposure is really bad. And speaking of wrinkles there is one cream I know, the prototype 37c, that is said to give the fastest result without the use of surgery. If it is true then those that are afraid to undergo invasive treatment will be delighted. So with this very hot summer make sure to protect your skin. Apply sun block daily and treat wrinkles early. After I gave birth I felt that my hair started to fall off. I got long hair already and I had a hard time combing it after I take a shower. I looked for hair loss cure but I can't find products that stopped the falling hair. So after two months from giving birth, I decided to have my hair cut. I just want to have a manageable hair and less tangles so it will not break and fall more when I brush it. Last week when I went to the mall I decided to stopped by at the salon. Good thing our DD2 was asleep in her stroller and so my friend watched the kids while I had my haircut. I am happy with the result. It is way shorter and easy to manage. I noticed less hair breakage and I don't see more falling hair after shower. I use a leave on hair cream that is said to help managing my hair and has vitamins to keep hair from falling. Hope this really helps.